CQ is now available in a digital edition as well as the traditional print edition. Click here for details. Our first issue for 2015 is a combined January/February issue, which we hope will allow us to get back on our normal distribution schedule for the print edition of CQ. All subscriptions - both print and digital - will be extended by one month because of the combined January/February issue. 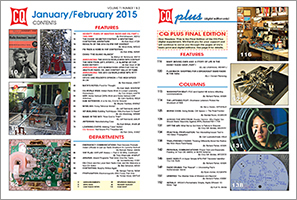 In addition, for digital edition readers, this issue is the final one in which our CQ Plus supplement will appear. It is our sincere hope that these further changes will provide the boost we need to get everything back on schedule and keep it there. We greatly appreciate your patience, loyalty and understanding through the past, very difficult, year; and we look forward to better times as we enter our eighth decade of publication. 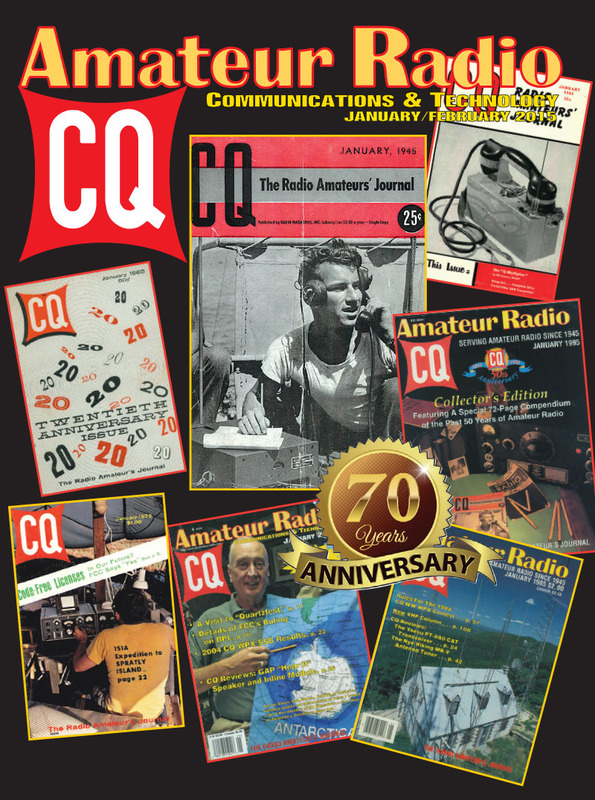 The January/February 2015 issue of CQ is our 70th anniversary issue, and we take the opportunity to begin a review of the past 70 years of amateur radio and CQ history. Part I, covering our first 35 years (1945-1980), is in this issue. Part II will be in the March issue. January and February host the two weekends of the CQ World Wide 160-Meter Contest -- CW in January and SSB in February -- and for K7ZB and AB7E, that means it's time for a cold-weather radio adventure. KZ7B shares the fun in his article, "The CQWW 160-Meter Contest, A Wintertime Contesting Adventure." Speaking of the CQ 160 Contest, please note that the SSB weekend this year will be from 2200 Z on February 27 to 2200 Z on March 1. This is to avoid a conflict with the CW weekend of the ARRL DX Contest created by the fact that February this year has only three full weekends (we have more details in the January/February issue). We’ve also got results of the 2014 CQ WW VHF Contest, along with an article on the fun you can have using FM in VHF contests. In addition, Learning Curve editor Ron Ochu, KO0Z, reviews the new Heil Sound Pro 7 headset mic. January means that nominations are open for 2015 for the CQ Amateur Radio, Contest and DX Halls of Fame. Details are in this issue and here on our website. The nomination deadline is March 1. We've also got the rules for the 2015 CQ WPX RTTY Contest, coming up on February 14-15, as well as the 2015 CQ WPX SSB and CW Contests (SSB March 28-29; CW May 30-31). Among our columns this month, KH6WZ explains the differences between GFCIs (ground fault circuit interrupters) and AFCIs (arc fault circuit interrupters), which are required in much new construction today but are controversial and subject to false tripping from strong RF fields. Mobiling Editor AA6JR discusses minimalist mobile installations, Kit-Building Editor K0NEB reviews some basic construction techniques, and Antennas Editor WA5VJB takes us on a tour of a coaxial cable manufacturing facility. Finally, we welcome new DX Editor Bob Schenck, N2OO, and Propagation Editor NW7US begins a multi-part series on the history behind the science of propagation forecasting. In the January/February CQ Plus – the final issue for the expanded CQ digital edition – shortwave-listening expert Gerry Dexter, WPC9GLD, tells how SWLers are protesting the shutdown of Radio de Exterior España (REE). Also, updates on Radio Ukraine International, Radio Amhara (Ethiopia), Brazil’s Radio Inconfidencia, and Radio Bayak from Northern Cyprus. In Unwired, find out how a YL’s book cover picture pushed amateur radio to become the top-trending topic on the social media website Reddit. Her 15 minutes of fame! The irascible Kurt N. Sterba, KCQ6KNS, gives tips on how to make a small, but high-performance 2-element 10-meter Yagi. He draws on the wisdom of the late Bill Orr, W6SAI, one of the top antenna experts of the 20th Century. Also, get updates on the latest FCC and Congressional actions that affect hobbyist communications operators across the United States in Washington Beat. 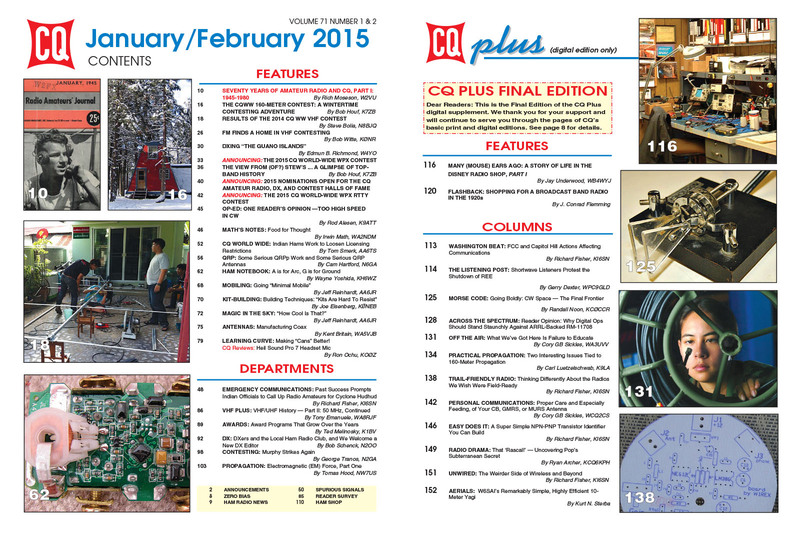 That's a brief look at what's coming up in the January/February issue of CQ and CQ Plus. For information on becoming a CQ subscriber, click here! Zero Bias - "Anniversaries and CW Contests"
On the Cover: It's our 70th anniversary! Our cover profiles issues from January 1945, 1955, 1965, 1975, 1985, 1995 and 2005.